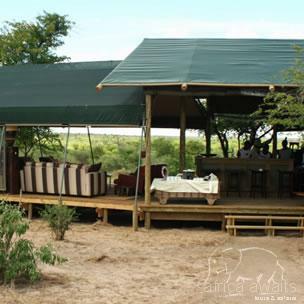 This Camp is situated in a remote part of the diverse Central Kalahari Game Reserve and offers some of the best summer wildlife viewing opportunities in Africa. This reserve is the largest conservation area in this country and at 5 million hectares, one of the largest in the world. The camp is beautifully situated on an immense pan just 20km from Deception Valley and comprises 10 en-suite canvas units with a sleep-out above each one from which to enjoy the night skies. The main area with lounge, dining area and central bar also has a separate swimming pool and deck area. 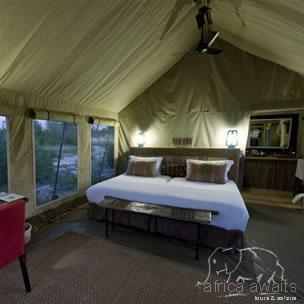 The tents and main area are all raised off the ground to catch the breeze and take in the sweeping, spacious views across the Kalahari. Solar power provides electricity and hot water, and the innovative insulated canvas walls and roof keep the temperatures inside the units comfortable. Thanks to the diversity of habitats, healthy game populations move through the area and are present to a greater or lesser degree all year long. But it is the summer months (end-November to April) with the advent of their rains that the desert truly comes to life. Short grasses sprout in the pan systems and fossil riverbeds and plains game such as springbok, gemsbok and wildebeest converge in their hundreds and thousands here to feed. This of course attracts predators such as lion and cheetah; in fact the abundance of game at this time of the year also leads to thrilling lion and cheetah hunts to be seen. 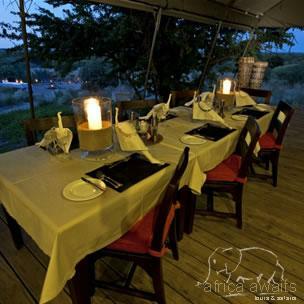 Guided game drives unlock the fascinating wildlife treasures found in this wonderful area with excellent cheetah viewing a regular feature. San Bushman experiences provide insights into the unique culture of this fascinating people. Kalahari Plains is easily combined with the Okavango Delta and Linyanti regions to provide a comprehensive Botswana experience - and in summer it is simply unbeatable as a wildlife destination. With your holiday, safari or business trip from in to Kalahari Plains Camp in Botswana.